While on a frivolous time travel mission to research Earth’s history, circa 1968, Enterprise accidentally intercepts a transporter signal from an unknown source over a thousand light years away. 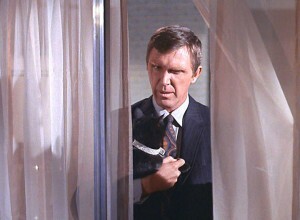 A well-dressed man holding a black cat beams onto their transporter pad and looks at them dramatically. VOICEOVER: Today police rounded up still another group of dissidents. Authorities are as yet unable to explain these fresh outbreaks of treasonable disobedience by well-treated, well-protected, intelligent slaves. Now turning to the world of sports and bringing you the taped results of the arena games last night. They watch a gladiator fight before the transmission cuts out. 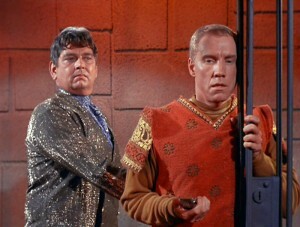 Spock identifies one of the gladiators as a flight officer aboard the Beagle. KIRK: Slaves and gladiators. What are we seeing, a twentieth-century Rome? Tags: ancient rome, bad history, forgotten slavegirls, gladiators, guns solve everything, half-naked man-fighting, history, jesus christ solves everything, old movies, romans, where are all the tunics? 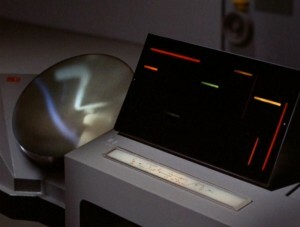 Tags: computers, crazy scientists, logic, poetry, Starfleet is stupid, talking to death, the singularity, war games, What does a starship need with God?